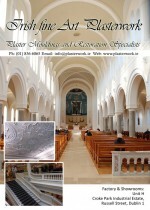 We are the largest plaster moulding company in Ireland. We have the largest selection of stock of Plaster Cornices, Plaster Centre-Pieces, Plaster panel moulding and many more products. We are currently updating our online showroom to list our entire stock. View our extensive selection of Plaster Cornices and Centre-Pieces. We carry out extensive plaster restoration work throughout the Country and can Match or reproduce any moulding either from an original model or from a photograph. We work countrywide and carry out work ranging from restoring period houses to supplying new plaster Cornice to modern homes. Our Showroom is five minutes from Dublin City Centre ,On display we have the finest selection of Plaster, fibreglass and Glass re-inforced cement Products. Our company was formed in 1988 and has grown to become the largest in the country carrying out extensive plaster restoration work throughout the Country.